No one knows who threw the bomb near Haymarket Square on the night of May 4, 1886. It’s one of Chicago’s most vexing unsolved mysteries. But there’s little question that this violent act had huge repercussions — not only in Chicago but around the world. We took a wide-angle view of what “culture” means — to quote one dictionary definition, it’s the “ideas, customs, skills, arts, etc. of a particular people or group in a particular period.” Talking with five historians who have written about Haymarket, it becomes clear that this 1886 incident changed Chicagoans’ ideas about many things, especially labor, politics and justice. And in countless ways, it changed how the city’s people looked at their fellow Chicagoans — whether it was a factory owner and a laborer facing off, or a person born in America suspiciously eyeing an immigrant from Europe. Haymarket left a lasting stigma on radical movements. Ever since, the public has imagined anarchists as bomb-throwing fiends. Tensions were already running high between wealthy business owners and poor workers in Chicago, but Haymarket made them even worse. Historians say it set back the labor movement for decades. But it also spurred some Chicagoans to seek ways of defusing that tension and making the city a more civic place. On May 1, 1886, hundreds of thousands of people across the country — and 30,000 in Chicago — went on strike, demanding an eight-hour workday. Two days later, strikers scuffled with replacement workers at the McCormick Reaper Works on the Southwest Side. Police fired into the crowd, killing two strikers. 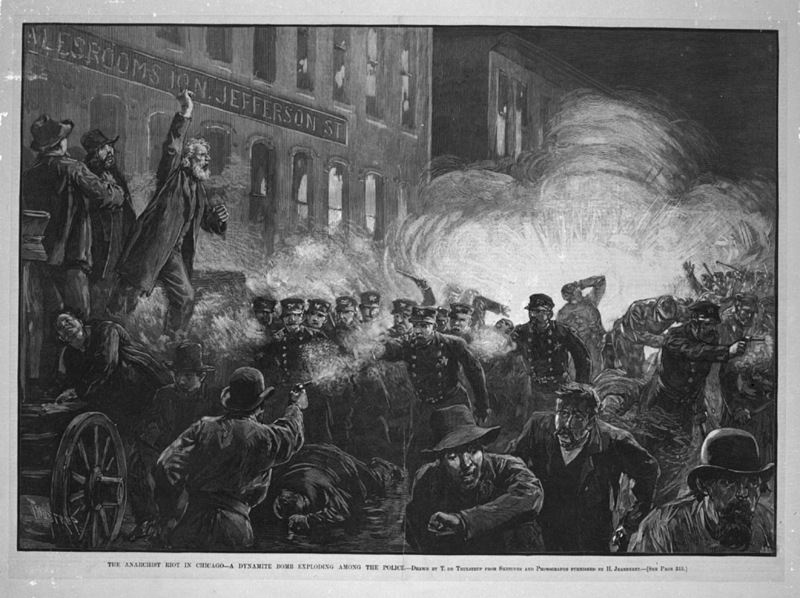 Outraged by the police violence, anarchists held a rally on the night of May 4 at Haymarket Square, near Randolph and Desplaines streets. Around 1,500 people gathered to hear speeches. Mayor Carter Harrison Sr. watched for a while, then decided to go home. It looked peaceful to him. By 10:30 p.m., as the crowd was dwindling, a line of nearly 200 police officers came marching down the street. The police ordered the crowd to disperse. Just then, a bomb came flying toward the cops and exploded. Gunfire erupted. Some witnesses said later that the police fired most of the bullets. Others said that people in the crowd were shooting, too. By the time it was all over, seven officers were dead or dying. Four people in the crowd died. Dozens of people on both sides were wounded. In the coming days, police rounded up dozens of anarchists across the city. That summer, eight radicals were put on trial. Just a few of them had actually been at the rally in Haymarket Square. Prosecutors didn’t know who threw the bomb, but they persuaded a jury that these men were guilty of a bombing conspiracy. Seven of the men were sentenced to hang, and one (Oscar Neebe) received 15 years in prison. Two of the men facing the death penalty (Samuel Fielden and Michael Schwab) asked for clemency, and Republican Gov. Richard Oglesby reduced their punishment to life in prison. Another one of the men on death row, Louis Lingg, killed himself in his jail cell with a smuggled blasting cap. That left four men who had refused to ask the governor for mercy: Albert Parsons, August Spies, George Engel and Adolph Fischer. On Nov. 11, 1887, they were hanged at the same time on the gallows at Cook County Jail. Six years later, a new governor — Democrat John Peter Altgeld — pardoned the three Haymarket defendants who were serving time in prison (Fielden, Schwab and Neebe). Altgeld called the trial a miscarriage of justice. To find out what effect these events had on Chicago’s culture, we spoke with five experts. The following is an edited transcript from separate phone interviews with these five authors. What sort of tensions was Chicago experiencing leading up to Haymarket? Dominic A. Pacyga: We sometimes don’t realize how violently divided we were in the 19th century. After the Civil War, people thought there was going to be another civil war, but this would be between the working poor and the rich. It didn’t happen, but it certainly seemed like it was going to happen. James Green: It isn’t surprising that (the bombing) happened, given the culture of violence and conflict that had been festering in Chicago ever since 1867. Gov. Oglesby signed a bill, making eight hours the legal workday, on May 1, 1867. What happens? Well, employers refuse to obey the law. There’s rioting. That starts a cycle of violence. Employers don’t want any sort of state intervention. The unemployed demand relief. Well, that causes a riot. The radical Republicans — Oglesby and the folks who saw themselves in Lincoln’s tradition — wanted to mediate this. The failure of that means the more savage forces inherent in the industrial process in Chicago take over. There’s a lot of violence in the workplace. There’s violence in the streets. People were engaged in violent acts on both sides. And the police are in the middle and often blamed for it. Timothy Messer-Kruse: The bombing occurred in the context of the first-ever national general strike. The idea was that any worker who had not achieved the eight-hour workday at their place of employment would go on strike on May 1. The simultaneous striking of millions of workers would simply create a cascading change across the country. And that would force both politicians and employers to recognize labor’s power. Everybody in industrial settings, they did toil very long days. In those days, 10 hours was standard. In many areas, it was sunup to sundown. Pacyga: In the packinghouses, they generally worked until all of the animals were slaughtered. Most male workers were completely removed from their family because of the 12-hour or 16-hour day. In the steel mills, there were two 12-hour shifts. You worked six days a week. Leon Fink: The anarchists were the left wing of the eight-hour movement. And within that left wing, there was a fringe of anarchists who counseled the use of bombs and dynamite. They justified it — at least publicly — as something they would only resort to in the face of police violence and as a defensive mechanism. But it seems clear there was a fringe of anarchists who were stockpiling bombs. Carl Smith: I think most of (the Haymarket defendants) are nonviolent people. They were convicted for what they said, not what they did. But yes, they certainly rhetorically preached violence as a solution. They preached a sense that violence is being practiced on them, day in and day out in the system — the billy clubs of the police. In their worldview, it was a life-and-death battle. Messer-Kruse: Among those eight defendants, there clearly were people who were willing to use violence for political ends — Louis Lingg, very clearly. The evidence is overwhelming that he made the bombs, including the bomb that was thrown at the Haymarket rally. He had dedicated his life to the violent overthrow not only of the government but essentially all bourgeois institutions. (The Haymarket defendants include) individuals who philosophically agree that the industrial society was so unjust, so murderous in its daily operation, that it had to be overthrown through some sort of mass, violent insurrection. How did Haymarket affect the labor and radical political movements? Pacyga: Oh, it devastated the labor movement and the radical movement. Everybody who was involved with the May Day strike was tainted by the bombing. We still don’t know really who threw the bomb. But the people in power used this as an excuse to really destroy the labor movement, to destroy the labor press and to move against all attempts to organize workers across the city. Smith: What the press and leading businessmen tried to do was tar all labor organizing with the brush of anarchism and to link anarchism with bombing. People started associating labor unions with bomb-throwers. Messer-Kruse: Haymarket definitely threw a big monkey wrench into the direction of American labor activism. When the bomb went off, Chicago went from being a city involved in what was becoming a complete general strike to a city pretty much on lockdown, with police investigations of this bombing. The eight-hour movement was stopped in its tracks. Many workers in Chicago and elsewhere were actually winning concessions from their employers. Workers had been peacefully on strike, negotiating with their employers. When that bomb went off and police were killed, (labor activists) suddenly lost a lot of power and lost a lot of respect. Many employers who had conceded the eight-hour day in Chicago took it back. They simply tore up those contracts and took it back. Had that (bombing) not happened, it could very well have gone otherwise. If the eight-hour day had been secured, then labor leaders would’ve been emboldened to continue those kinds of tactics — and to view their role as being not only involved in their individual labor unions but involved in the general politics of the nation. When the bomb went off, it went exactly the other direction. Labor leaders abandoned any idea of mobilizing this kind of public activism. America’s trade union leaders become very conservative after Haymarket. They primarily become concerned with the interests of their own narrow sector of the workforce, and not with the nation as a whole. Green: It was certainly a crushing blow to that revolutionary left wing. The doctrine of force as a political philosophy disappears. What it did was drastically limit what the public debate about working conditions could be. It was no longer admissible to talk about it being so bad that something radical had to happen. That was out the window. If the bomb hadn’t exploded that evening, it might have (shown) that citizens could go into the streets and nonviolently protest for their rights, and that the employers would concede and people would move on in some nonviolent way to some kind of mediated workplace situation. It would also have meant that there was still a radical voice within the house of labor, saying, “We may have the eight-hour day, but there’s something fundamentally rotten about this system. And ultimately, unless we replace it with another kind of economy, we’re going to be in trouble.” But that voice was gone. After Haymarket, the American Federation of Labor started to embrace a very limited version: just shorter hours and better living wages — that’s all we want, you know? Pacyga: There was a tremendous amount of public reaction against labor unions and against the Knights of Labor, which was the largest union at the time. There were about 700,000 members nationally. From that point on, the Knights of Labor really struggled and there was not that much future for it. Fink: Chicago was a leading Knights of Labor center. The Knights encompassed everyone from small businessmen and professionals down to the unskilled, including African-Americans and women. They were probably the most inclusive social movement of the late 19th century. And they were a powerful social force. They saw themselves as the preserver of the American Dream for the mass of people in the aftermath of the Civil War. They were against monopoly and against the seizure of the political system by a new moneyed elite. They believed in the ballot box. They believed in peaceful protest. They really were not in favor of strikes or confrontations, and engaged in them only as a last resort. So, their leadership was quick to disassociate itself from the anarchists, but Haymarket tarred their public reputation. They never ever recovered. The setback here reverberated around nation. Pacyga: It wasn’t until the beginning of the 20th century that the (labor movement’s) recovery over Haymarket began to take place. But even then, the labor unions were pretty much kept out of power until well into the 1930s. Green: Eventually, more and more workers win the eight-hour day. In 1938, it becomes a mandate of Congress. How did Haymarket affect politics in the Democratic and Republican parties? Messer-Kruse: It probably didn’t shift too much of the politics on the ground. Chicago remained a labor stronghold throughout this period and well into the 20th century, and the politics revolved around labor. Pacyga: People on both sides of the political spectrum, Democrats and Republicans, tried to get leniency for the Haymarket martyrs. But Marshall Field really pushed — he wanted them to be punished. People like (Haymarket defendant Albert) Parsons had been a pain in his side for a long time. Marshall Field wanted them hanged. Green: Lyman Trumbull (a former U.S. senator who lived in Chicago), who’s another one of these Lincolnian Republicans, thinks that these men’s lives should be spared. It’s a conflict within the Republican Party over this whole thing. In the end of course, there’s no question what will be the outcome. Smith: No mainstream politician defended them. And Altgeld (Gov. John Peter Altgeld, the Democrat who pardoned the three Haymarket defendants serving prison sentences in 1893) didn’t defend them. He said that they didn’t get a fair trial. He called it a miscarriage of justice. He didn’t say they were right. Pacyga: He hurt his political career with the pardons, absolutely. He turned the power elite against him. Messer-Kruse: I don’t think that’s really true. In fact, you could argue that it actually was a springboard into other politics. For example, during the great 1896 Democratic convention in Chicago, Altgeld was clearly the toast of the convention. Fink: For the conservative forces in either party, Haymarket provided a kind of ready reference for the fears and threats of radicalism. The Haymarket defendants were quickly seen as un-American, as a threat to the social order. The Democrats would try to peel off the rank-and-file of the labor and radical movement. They would say: “We can provide certain benefits if you’ll come under our umbrella.” For many former labor movement types, the Democratic Party became the only game in town. Pacyga: The Democratic Party appealed to solid bread-and-butter unionists who simply wanted things like better conditions, better pay, paid vacations. How did Haymarket affect immigrants living in Chicago? Fink: It forced most immigrant groups to prove their respectability. Pacyga: There was tremendous anti-immigrant reaction and anti-Catholic reaction. Here were these Germans talking about throwing bombs and a bomb gets thrown. It proved the point that these radical ideologies were coming in from Europe and the gates should be closed. There was a lot of class tension within (immigrant) communities. A lot of the cops that were killed were Irish working-class cops. (They) were putting down a working-class demonstration, which Irish attended. This ripped all these ethnic communities apart in one way or the other. Messer-Kruse: Haymarket provided tinder for (the anti-immigrant) movement by associating immigration and lawlessness and anarchy, but I wouldn’t take that too far. The anti-immigrant tensions in a city like Chicago are not necessarily caused by the Haymarket bombing. They’re caused by many factors. Green: Chicago was such a polyglot city that it was almost a little too late to be talking about pulling up the gates. I wouldn’t say Chicago in the 1890s was a particularly hostile place for immigrants, more so than any other city. How did Haymarket change the police and courts in Chicago? Messer-Kruse: The Chicago police were already beginning a long process of professionalization and modernization. And this event certainly sped that process up quite a bit. It also leads many states to take on more responsibility for the policing of labor struggles. How did Haymarket shape Chicago’s reputation? Messer-Kruse: Not that Chicago needed a lot of help, as far as its reputation goes, but from this time on, it does have a reputation as a hotbed of radicalism. Fink: It was an immigrant city. It was not in the hands of “respectable” Americans. So it had a kind of dangerous edge to it in the popular mind. On the other hand, for the political left, especially internationally, Chicago became famous for its radicalism and its martyrs. Like other flamboyant episodes of violence — like (John) Dillinger or (Al) Capone or other moments of disorder — it added to Chicago’s reputation as a city on the edge. Smith: The bombing hurt Chicago’s reputation, certainly. But it didn’t slow its growth in any way. The population doubled in the 1880s and then doubled again in the 1890s. So in terms of people voting with their feet or capital coming in — or the decision to hold a World’s Fair here (in 1893) — Haymarket didn’t stop any of that. Pacyga: Chicago’s position along the railroad lines and water make Chicago such an optimal place to invest in that (business owners) ignore these things. Plus, you’ve got a government that generally supports big business. Ignores pollution. Ignores the times when big business steals water. Green: I’m sure that the city fathers, (Tribune publisher) Joseph Medill and all of the big business guys were saying, “Well, see, we took care of this problem now. We’re not going to let that happen again.” It may have in fact enhanced their reputation as tough law-and-order people keeping the lid on things. Of course, they failed. Something far worse occurs in 1894, the Pullman Strike. That was much, much worse violence. Green: In Jane Addams’ Twenty Years at Hull House, she talks about coming back from England around 1889. The city was still taken up with Haymarket. People were still tense. There was this attempt on her part and other liberals to try to create a civic forum where all of the hard feelings about Haymarket could be discussed and opened up and a new civic culture could be created and there wouldn’t be so much hatred and class bitterness. That’s what Hull House was about. The 1893 World’s Fair is the symbolic triumph of that spirit: the great Chicago, the beneficent Chicago, the modern Chicago. Sometimes, these horrific events, acts of political violence, cause a city to do some sort of soul-searching. How did Haymarket affect the image of anarchists? Messer-Kruse: Before that time, anarchism was a much broader movement. It included a lot of philosophical anarchists who today we might term libertarians. After the Haymarket bombing, the popular understanding of anarchism becomes the bomb-throwing fiend, hiding behind a cape. A very rich and diverse philosophical movement gets collapsed into this one dimension of nihilism. Pacyga: Anarchism seems to me to be a utopian kind of idea. But after Haymarket, anarchists became these kind of slimy, bearded, bomb-throwing, evil monsters. All the cartoons in the press that appeared have people with long beards and long hair, and holding bombs in their hands and knives in their other hand — just these hideous kinds of criminals. Fink: The anarchists were through after Haymarket. Basically, they were rounded up. They were deported if they weren’t jailed. Haymarket — followed by the assassination of (President William) McKinley at the hands of an anarchist just after the turn of the century — that finished (them) off as all but a fringe within the radical left of the country. Messer-Kruse: The cultural image of the bearded, stooped, dark, bomb-throwing anarchist has carried through to the present day. The very symbol of the sort of the round, globe bomb with the hissing fuse on it passes (through) the popular culture right up to Boris and Natasha and “Spy vs. Spy.” I think that image was born in the Haymarket. That image of the sulking, loner foreign, bomb-throwing anarchist has a great resonance in American culture. What connections do you see between the events of Haymarket and today? Green: As in the 1880s, Chicago is a city of immigrants and a city of immigrants who are wage-earning people, many of whom are in low-wage occupations, many of whom may not be citizens at all or are viewed as second-class citizens. There are similarities with the Gilded Age and the extremes of wealth. The unions are pretty tough in Chicago, but they’re under assault. The mayor (Rahm Emanuel) would certainly love to get rid of the teachers union. There’s a lot of pressure on unions to give up things. The eight-hour workday — for a lot of people — is not feasible anymore. You need to work two jobs and overtime. Fink: The larger issues of inequality, worker rights, the basic decency of the workplace are still very much alive today. And some of the issues — the length of the workday and whether there’s a minimum wage — have returned to the political surface. Our culture is also constantly challenged by those who would find scapegoats as a way of turning away from the central issues raised by a movement or by radicals. Pacyga: The Occupy Chicago movement — I suppose the police are making these people out to be anarchists, but I don’t think that, generally, the Occupy people are violent. Think about how (Chicago Teachers Union President Karen) Lewis thinks about (Mayor) Rahm Emanuel today. Whose side is he on, according to the Chicago Teachers Union? There’s always been that sort of conflict. In Chicago, people with clout are generally people who have money. And people who have money are not interested in supporting strikes — generally speaking. America is a very middle-class culture. Revolutionary movements sprout up periodically, but they pass — because the majority of people do not embrace these ideologies. And if they embrace ideologies, they embrace them on the right rather than the left. That’s part of our historical tradition. 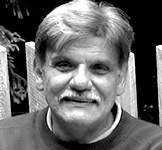 James Green, a history professor at the University of Massachusetts Boston, wrote the 2006 book Death in the Haymarket: A Story of Chicago, the First Labor Movement, and the Bombing that Divided Gilded-Age America. 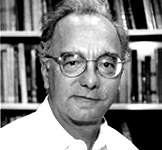 Carl Smith, an English professor at Northwestern University, focused on the incident’s cultural effects in his 1995 book Urban Disorder and the Shape of Belief: The Great Chicago Fire, the Haymarket Bomb, and the Model Town of Pullman. 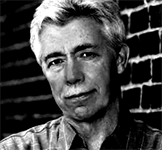 He also curated the Chicago History Museum’s The Dramas of Haymarket website. Dominic A. Pacyga, a history professor at Columbia College Chicago, put Haymarket into the context of the city’s history with his 2009 book Chicago: A Biography. 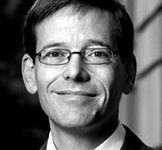 Timothy Messer-Kruse, a history professor at Bowling Green State University in Bowling Green, Ohio, has stirred controversy with his books The Haymarket Trial: Terrorism and Justice in the Gilded Age (2011) and The Haymarket Conspiracy: Transatlantic Anarchist Networks (2012), asserting there was actual evidence connecting some of the Haymarket defendants to a bombing conspiracy. Leon Fink, a history professor at the University of Illinois at Chicago, has written several books on the Gilded Age and labor movements in the late 1800s. Robert Loerzel is a freelance journalist and the author of Alchemy of Bones: Chicago’s Luetgert Murder Case of 1897. Follow him at @robertloerzel.